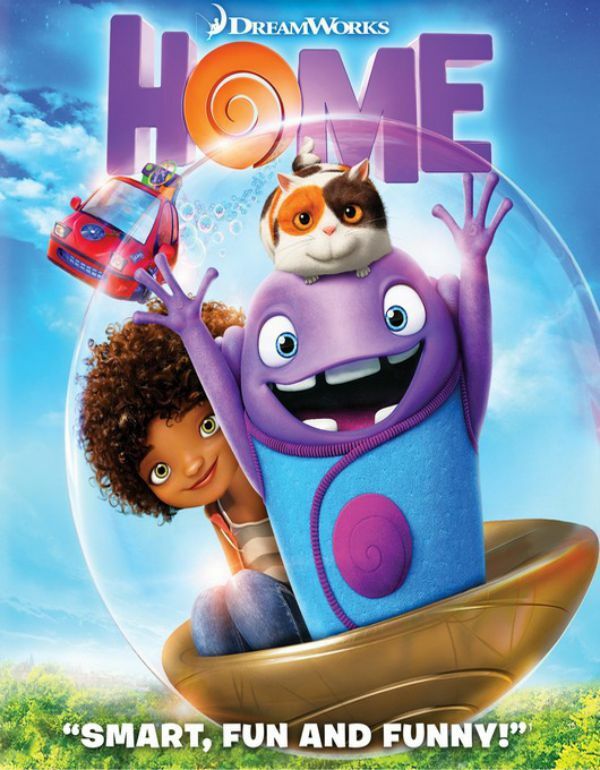 Home is a CG science fiction comedy from last year that’s ambiguously a Christmas movie. 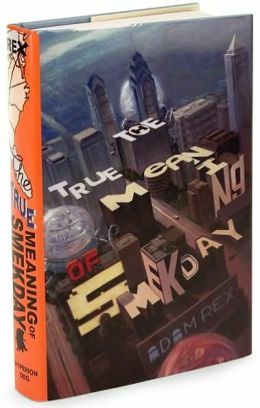 It’s loosely based on the 2007 novel, The True Meaning of Smekday. It’s not a clear enough example to be covered in the normal season, but we felt it deserved a spot in our archives. We’re trying something a little different on this one: instead of posting a review written by one of us, we’re presenting this as a discussion. Let us know what you think of the format: we're thinking of adding it to our standard repertoire. Erin: Let’s start with the story. The movie is set immediately after the events of a disappointingly bloodless alien invasion where the human race is transported to Australia. A girl’s left behind, and she befriends an outcast alien who’s inadvertently endangered the planet by sending a party evite to another alien race. The girl’s trying to find her mom, and the alien’s trying to undo the damage he’s done. You get the idea. Unlike me, you actually read the book. How’s the premise differ? Lindsay: The outline of the premise is the same: technologically advanced but somewhat bumbling aliens forcibly relocate the people of Earth, girl (Tip) runs into alien on route to find her mom, adventure ensues. The big difference, and the big weakness, with the adaptation is perspective. The movie follows the alien character primarily, but the book is told entirely from the girl’s perspective - in fact, it’s an essay she’s writing about the invasion (somewhat grudgingly) after the fact. There are some significant differences in the plot - the book takes place over more time, involves more humans, and is overall less ridiculous. The resolution is entirely different and the alien’s role is different, but I think all these changes stem from making the alien the center of the story. Erin: That’s a good point. My biggest issue with the movie (aside from it not being funny) was its childish tone. The Boov were portrayed as Looney Toon-style characters, and very little was taken seriously. Lindsay: The book is more serious. It’s appropriate for children, but there is genuine tension and adversity. It’s funny, I read the book to try and figure out if we should do it (and the movie) for Mainlining. But the movie has more Christmas in it. Erin: And even then, not all that much. I think EVERYTHING we watch counts as a Christmas movie (I'm still not backing down from Frozen), and - honestly - I can’t even seriously claim this one as any more than a technicality. There’s just enough to make a case, but it’s a contrived one. Especially since things like this typically come down to a question of intent, but we actually know the reason this time… and it’s not thematic. Some of this movie is set at Christmas, but it’s really just an homage to Smekday, a concept that was basically cut entirely. Lindsay: To be fair, Christmas is implied in the title of the novel. The Boov follow Captain Smek; the day they land is renamed Smekday in his honor. The Boov don’t care that it used to be called Christmas. Most of the action of the book takes place later, but the name of Tip’s essay is a bit of a joke. Get it? Tell us the true meaning of Christm-Smekday. Erin: So, if I understand this right, Smekday is intended as an alien replacement of Christmas, similar to the way Christmas replaced Saturnalia. Lindsay: More or less. Here’s a fun little video explaining Smekday! Erin: That short is better than ANYTHING in the movie. At any rate, the movie starts at Christmas. The lights and decorations are still up, and there’s a light plot point about Tip wanting to bring her mother a Christmas present. Should we spend time explaining the J.Lo thing? Because, again, that’s better than any joke that was included in this movie. Lindsay: Sure. In the book, the Boov take Earth names that humans can pronounce, and the Boov that Tip travels with calls himself J.Lo Because they learned English (and other languages) somewhat haphazardly from a handful of abductees. Erin: Back to Christmas. Tip and Oh (since they decided against calling him J.Lo, even though the Jennifer Lopez was in the cast and would almost certainly have been cool with it) take off on what I’m pretty sure was late night on the 25th. There’s snow on the ground - remember that. Because the director doesn’t. When they land in Paris a day later, there’s grass in the fields, green leaves on the trees, not a decoration in sight, and it’s sunny. Other than the unopened present and a brief flashback to seeing Tip’s mom getting abducted with the rest of our species, we’re through with Christmas. To be fair, the gift does come up again, along with a quick call-out to the holiday. It’s what I’d call a light plot-point: the present is used to save the day in typical MacGuffin fashion. Weirdly, it’s not actually played up emotionally, though. It’s purpose is to be used as a mirror in a brief call-back, not as any kind of symbol for family, love, seasonal affective disorder, or any of the other traditional Christmas messages. That’s why I say this really isn’t a Christmas movie, at least not in any meaningful sense. The fact the gift is technically present for the entire story and is required to resolve the story gives us an excuse to talk about it, but the holiday is clearly just here as an allusion to the book. They couldn’t even be bothered to maintain the facade when they switched locations. Lindsay: So the presence of Christmas has no emotional weight. My opinion’s skewed - was there anything you thought did have gravitas, or otherwise emotional impact? Erin: Gravitas? Not really. But that doesn’t mean I hated everything. I really liked Tip. She was tough, quick-witted, and fun, without feeling overpowered. I thought Rihanna did a good job voicing her, as did Jennifer Lopez with her mother. Erin: I don’t actually agree that Oh was the lead. He got some time at the beginning, but I felt like I was watching Tip's story get interrupted with his, not the other way around. She was definitely the POV character throughout the movie. Lindsay: Except that Oh’s narration opened and closed the movie. All the most terrible scenes didn’t have Tip in them. There’s that. Erin: Narration doesn’t necessary imply lead status. I think we’ll have to agree to disagree on this one. At least we can both agree that Tip was a billion times better, and every second Oh was on screen was painful. In addition to Tip (or maybe because of her), I found the movie’s story arc mostly satisfying. It wasn’t at all moving or insightful, but it worked just well enough for me not to hate the movie. High praise, I know. Also, I kind of love that the Boov were basically Americans. There’s not a lot of substance to this film, but at least that subversive point survived the process of adaptation. Lindsay: I didn’t hate it either. I found parts boring, and parts annoying, but I laughed a few times, and the resolution was kind of okay for sci-fi aimed at very small children. Not as funny, smart, or satirical as the book, but I would say younger kids might like it. Erin: Speaking of boring and annoying, I just realized we forgot to give a shout out to Jim Parsons, the voice of Oh. I agree this has some value as a kids movie. It’s not great entertainment, but it provides a good POV character in Tip and plenty of jokes that might appeal to anyone whose brain hasn’t finished forming.